WATER PARK FUN AND MORE! Most people are familiar with the benefits of upgrading their base ticket to a hopper pass but today I want to talk about the Water Park Fun and More add-on. Let’s start with some of the basics of pricing. Everyone starts with the basic Magic Your Way theme park pass for as many days as you like. The price per day gets less and less the more days you add. The Hopper and Waterpark add-ons do not work the same way. It is a flat fee added to the cost of your base ticket. As of June 17th, the price for adding on either the Hopper or the WPFAM is an additional $62.83 regardless of having an adult or child ticket. And you can add on either one without having the other. If you decide to get both, you will save as adding both add-on’s to a ticket costs $89.50. This is kinda big! If you normally buy the hopper pass for your family, you would get entry into a water park for less than $27!!! A one day ticket to either water park is $56.45! This is HUGE SAVINGS particularly for repeat guests who are looking to do activities outside of the four main parks. 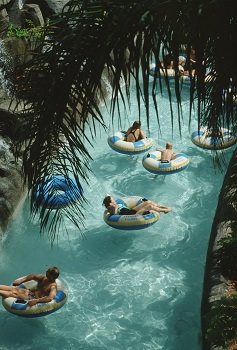 Disney’s Blizzard Beach Water Park – This water park brings the thrills of a ski resort to Orlando. There is something for every age group from wild drop slides to lazy rivers. This water park has one of my all-time favorite family rides, Teamboat Springs! This twisting and turning raft ride is nice and long and fits a family of six! Disney’s Typhoon Lagoon Water Park – As the story goes, a typhoon struck disaster but as the water receded, it resulted in lots of great water attractions. Typhoon Lagoon boasts the big wave pool where every half hour waves ranging from bobbing swells to 6 foot waves delight swimmers. You can also swim with sharks at Shark Reef, an opportunity to snorkel across a small lagoon filled with fish and yes even several (very passive) sharks! DisneyQuest – An indoor interactive virtual theme park with ride simulators, high-tech games and hands-on activities. 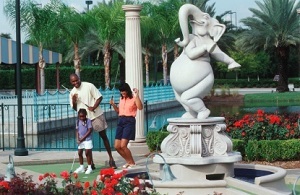 Two Miniature Golf Courses – Disney’s Fantasia Gardens or Disney’s Winter Summerland Miniature Golf Course – Both very well themed and lots of fun. Disney’s Oak Trail Golf Course – A family-friendly 9-hole, par 36 walking golf course set in rolling greens and exciting challenges. This cooperative wildlife sanctuary lets you test your skills with holes ranging from 132 to 517 yards from the white tees. 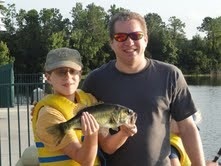 It’s operated by Arnold Palmer Golf Management and features junior tees for younger golfers. ESPN Wide World of Sports Complex – 220 Acres of professionally run, state-of-the-art sports facilities which hosts over 60 sports and thousands of events for athletes of all ages and abilities. 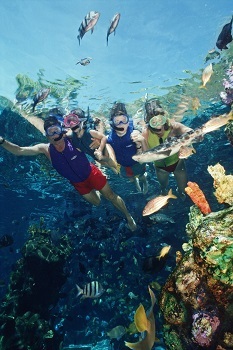 While most families who are visiting Walt Disney World for the first time will have more than enough to do with exploring the four main theme parks and the amenities of their resort, anyone who is either a repeat guest or is enjoying an extended stay should definitely consider adding on the Water Park Fun and More to their ticket. Let’s talk about this option when I help plan your next Disney World vacation!! You’ve decided on the best resort for your family and budget; you’ve figured out which park tickets to get and for how many days and now your wonderful Disney Travel Expert (hopefully me!) has booked your package and the deposit is paid! Now what?? Now the fun really begins as your itinerary begins to take form and we begin choosing which restaurants you would like a dining reservation. 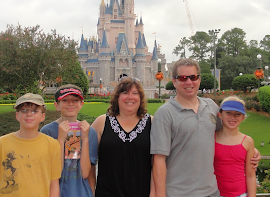 If your family is anything like my family, food is important and so is enjoying your meal in a venue that continues to provide the Disney magic. Dining in Disney is just as much a part of the experience as going on Splash Mountain or watching Fantasmic and this couldn’t be more true than at one of my family’s favorite restaurants: The Biergarten in Epcot’s Germany pavilion! When you walk into the restaurant you will first notice the long tables that circle the dance floor and stage and soon you’ll realize you are in a quaint Bavarian town square ready to celebrate Oktoberfest! Ticky tacky, ticky tacky Oy, Oy, Oy!! If your party is small, you will be seated with other guests. This has never been a problem for us and in fact, we’ve met some very nice people! Next it’s time to place your drink order which could include a big beer or a huge beer or perhaps a flight of beer samples! They also stock some wonderful German wines. Once the drinks are ordered it’s time to fill your plate! An all you can eat buffet provides the opportunity to taste dishes that perhaps you or your children are not particularly familiar with. As you might expect to find in a spread of Germany’s delicacies there are lots of brats and spaetzle (noodles) and the wonderful pretzel rolls along with soup, sauerbraten and chicken schnitzel plus a whole lot more! Hearty German foods designed to stick to your ribs and let’s be honest, your hips if it wasn’t for the miles of walking you’re doing every day. But hey! It’s vacation!! A favorite of ours, and maybe it’s a great choice for your family too! 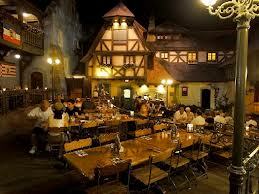 Let’s discuss The Biergarten and other Epcot restaurants when I book your next Walt Disney World vacation! 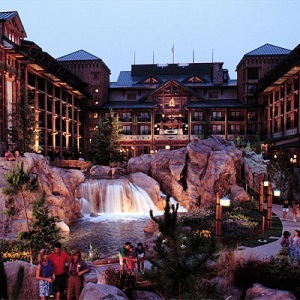 Today I’d like to share with you my thoughts on one of the best themed resorts on Disney’s property – Disney’s Wilderness Lodge and Villas. This incredible resort pays homage to the historical lodges of our Pacific Northwest National Parks. There is an amazing attention to detail and pictures cannot do the lobby justice. It would be difficult for first timers to walk through the doors without exclaiming “Wow!” There is so much to take in from the towering totem poles, to the teepee chandeliers, to the 82 foot fireplace depicting the strata of the Grand Canyon, to the footbridge that crosses over a bubbling hot spring which “feeds” the pool at the end of a babbling brook. There are so many details (and hidden Mickey’s!) to find, I encourage you to pick up a self-guided tour sheet. This resort is a Deluxe Resort but it is typically the most economical of the category. It’s a boat ride to Magic Kingdom or to the nearby Contemporary Resort where you can hop on the monorail which stops at the Ticket and Transportation Center and circles the resorts and Magic Kingdom. It offers several dining options: Roaring Forks, a quick service restaurant: Whispering Canyon’s, an incredibly entertaining family restaurant (be sure to ask for ketchup! ); and Artist Point, a fine dining experience. There is also the Trout Pass Pool Bar and Territory Lounge, which is next to Artist Point offering adult beverages and snacks. One of our favorite things to do is to order the cheese plate and a couple of drinks to go from Territory Lounge and find one of several hidden fireplaces tucked away on the upper floors overlooking the lobby! The Wilderness Lodge sits on Bay Lake and is one of the nightly stops for the Electrical Water Pageant. You will definitely want to make your way down to the docks to enjoy this light and music parade that dates back to the first days of Disney World. And you will also want to set your clock to be sure to catch Fire Rock Geyser, the Lodge’s version of Old Faithful which erupts every hour. The rooms at the Wilderness Lodge can be a bit small but there are some bunk bed rooms which provide a little better use of space than 2 queen beds and most kids love this option. For more space, the Villas at the Wilderness Lodge are a short walk from the lobby and offer accommodations that include multiple sleeping areas, living rooms and kitchenettes. 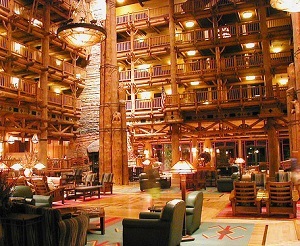 It’s easy to see why Disney’s Wilderness Lodge is one of the favorite resorts at Disney World. You will definitely want to put this amazing destination on your “to do” list. When you are ready to book your next Disney World vacation, be sure to ask me about staying at this incredible resort. I love that Disney is a dynamic place and even after many, many visits, there is always something new to try. I encourage every family making their return trip to find at least one or two activities you haven’t done before and go for it! And when I book your next Disney vacation, let’s be sure to discuss this and other options for your family to enjoy. As always, my job will be to take care of the details while your job will be to make magical memories with the people you love most!